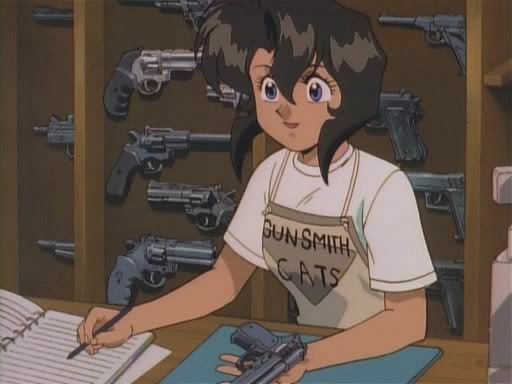 Gunsmith Cats, directed by Takeshi Mori. Three 30–minute OVAs. November 1, 1995 – September 1, 1996. Takeshi Mori was the director, but this was an anime version of Kenichi Sonoda’s very popular Gunsmith Cats manga, in Sonoda-san’s art style. The manga began in Japan in 1991. Toren Smith’s Studio Proteus adapted it into an American comic book published by Dark Horse beginning in May 1995, so by the time the American videos were released beginning February 1996, there was a big American fan demand for them. Gunsmith Cats is set in a stereotypical super-violent Chicago, full of crime, guns, and explosions. When Chicago becomes too lawless for the police to handle, who you gonna call? Teenage lesbian bounty hunters, that’s who! “Gunsmith Cats” (or Gun Smith Cats as some signage says) is a gun shop run by 19-year-old Irene “Rally” Vincent and her younger ex-prostitute partner “Minnie” May Hopkins, as their cover for being bounty hunters. Rally is a cool expert in hand guns, and the hyperactive Minnie May just likes to blow things up. (This brunette Rally is a complete reworking of the blonde character in Sonoda’s previous Riding Bean. She is noticeably darker-skinned than the other characters around her. No reason is given for this in the anime, but in the manga she is specified as of Hindi descent.) They are often assisted by Becky Farrah, a teenage mercenary who has come to specialize in selling her services to Rally & Minnie May, for safer profits rather than going after the big bounties herself. Gunsmith Cats the manga and American comic book became popular for Sonoda’s art style, especially his attractive teenage girls (often in lingerie) and his well-researched closeups of handguns and fast cars, notably Rally’s Shelby Cobra GT-500, and props such as freeway signs, American soft drink cans, and cigarette packages. The guns were drawn from weapons magazine pictures, since gun ownership is strictly controlled in Japan. Reportedly when Sonoda became famous with American manga & anime fans and was invited as a guest-of-honor to American conventions, he would take the opportunity of being in America to visit shooting ranges and examine real guns and American fast cars personally. The three-episode OAV featured an original story, produced by OLM, Inc. (Oriental Light & Magic.) The OLM staff made several location trips to Chicago to take background shots, to visit gun shops, police precinct stations, and the Chicago Police Academy, and to inspect guns and a Shelby Cobra GT-500. In Chapter 1, “The Neutral Zone”, released in Japan on November 1, 1995, the Gunsmith Cats shop is visited by Bill Collins, an undercover agent of the Federal Bureau of Alcohol, Tobacco, Firearms and Explosives. 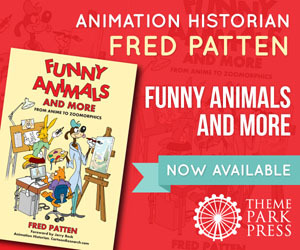 He reveals that the ATF is aware that Rally is dealing in illegal as well as legal weapons, and that Minnie May’s explosives are even more illegal. He wants them to cooperate in a sting against an illegal arms dealer, Jonathan Washington, in exchange for the ATF’s ignoring their illegalities and giving them licenses. The climax is a lengthy shootout in Washington’s arms warehouse while Becky cowers in Rally’s Cobra outside. Collins reveals about midway through to his ATF superior, George Black, that he has arranged the sting with independent personnel because he doesn’t trust anyone within the ATF; he suspects that someone is selling them out. Chapter 2, “Swing High”, released in Japan on April 1, 1996, introduces ex-Soviet Army Major, now freelance killer-for-hire Natasha Radinov. She’s hired to kill Jonathan Washington. Washington begs the Gunsmith Cats to protect him for his young daughter’s sake, but they refuse, suspecting a trick. When he is assassinated, under circumstances that appear to implicate Bill Collins as the ATF turncoat, they feel guilty and look for Washington’s daughter. They also continue to investigate Washington’s illegal firearms business, which gets Radinov hired to kill them. The climax is a lengthy high-speed car chase. Radinov appears to have been killed, but now the Gunsmith Cats have a personal reason for helping Bill Collins find Washington’s boss who is also the corrupt ATF agent. A visual joke at the beginning of Chapter 2 is an Illinois auto license plate with the Star Trek Enterprise’s NCC-1701 number. In Chapter 3, “High Speed Edge”, released in Japan on September 1, 1996, new characters from Sonoda’s manga are introduced: Roy Coleman, Rally’s friend in the Chicago Police; and Gray, Rally’s & Minnie May’s major antagonist, here in a bit part as Haints’ henchman. The ATF claims on TV news that the busting of Washington’s business and the “death” of Radinov means that the case is closed. Rally is invited by State Assemblyman Edward Haints, running for Mayor of Chicago, to appear with him at a campaign rally to accept an award. Radinov reveals that she’s still alive by challenging the Gunsmith Cats. Rally refuses to cooperate with Collins, who asks her to help him find the corrupt ATF turncoat. Collins and Cathy, an ATF co-worker, find evidence that the turncoat is George Black himself. The three Gunsmith Cats OAVs were released in America by A.D. Vision only three or four months after they appeared in Japan, in February and July 1996 and January 1997, in both subtitled and dubbed videos. American animation fans gave it high marks, although there was some grumbling about the unresolved subplot of finding Washington’s missing daughter. 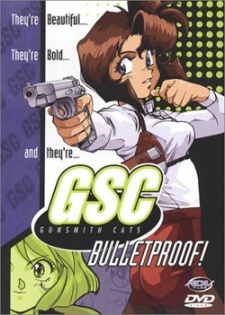 There was a bilingual DVD release of all three chapters as Gunsmith Cats: Bulletproof! on March 27, 2001. 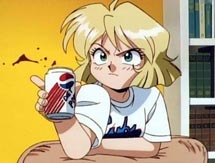 Dark Horse’s Gunsmith Cats comic book continued to February 2002, keeping the popularity of A.D. Vision’s anime alive. After that, it slowly faded away. 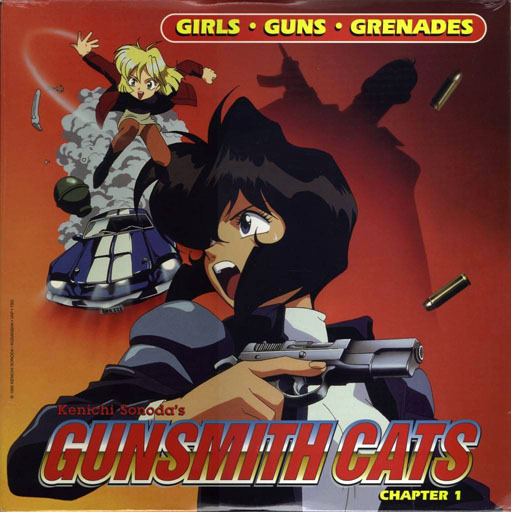 A manga and comic book sequel, Gunsmith Cats: Burst, was published between 2005 and 2008 in Japan and 2007 and 2010 in America, but it was never animated; besides, by 2009 and 2010 A.D.V. Films was disappearing. It’s all still available on Amazon.com today, but few people are looking for it any more. Sonoda’s grasp of anatomy is flawless, and his ability to create bizarre otherworldly technology that looks like it could actually function puts him on par with draftsmen like Jack Kirby. Another forgotten Sonoda OVA is Super Deformed Double Feature, half of which was a Wacky Races homage featuring Sonoda characters from Bubblegum Crisis, Rhea Gall Force, and others. It’s worth checking out even if the storylines are as thin as rice paper. Modern popular anime is lifeless compared to Sonoda’s work which was the medium’s pinnacle, I think. Excellent posts in this series! I could see Discotek Media rescuing this license for some reason. Sonoda was also good at real-life technology. I showed these to my brother, who at the time owned a Mustang Shelby Cobra of the same year as the one in the OAVs. He was delighted that every detail of the car’s exterior and interior was spot-on accurate; he could even identify certain non-standard aftermarket details that pointed to Sonoda having most likely based the car on an actual customized model. What is Sonoda-san doing today? He was red-hot with the anime and manga fans during the 1990s and early 2000s, but he seems to have faded away since then. 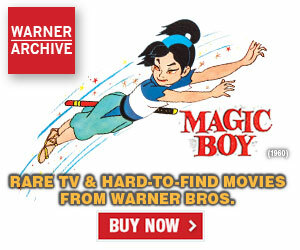 At first, when I saw the thumbnail, I thought this was about the show Totally Spies!